PremierArt Generations and Premier Art Matte canvases are a new breakthrough, state of the art inkjet coating technology yields the highest D-Max in the industry. The increased D-Max also yields the highest color gamut available in inkjet fine art products. Part of the PremierArt brand of imaging products, the Generations family of Fine Art canvas have been especially designed for image permanence, and are extremely resistant to pre-mature yellowing. Generations Satin Canvas – 350g is coated on a poly/cotton (65% Poly/ 35% Cotton) canvas base with a 2:1 weave for excellent stretching properties and added strength. Generation’s canvases are available in a photo grade with a Weaved Surface on a bright white water resistant base, and feature new coating technology yields the highest D-Max of any canvas product available in the market today, which dry’s instantly to produce exceptional print quality. These canvases are compatible with all Epson, HP and Canon aqueous based pigment inks. They are also compatible with Premier Art’s Eco Print Shield protective coating allowing the canvas to be stretched without cracking, increasing the life of the image. (Click to download Epson7880_PremSatinCanvas ICC profile). PremierArt Coatings have been formulated specifically for inkjet inks and media. They are of the highest quality and have been tested by Wilhelm Imaging Research and shown to increase the WIR Image Permanence Ratings on all tested media printed with Epson UltraChrome inks. Eco Print Shield - Best For Canvas - PremierArt Eco Print Shield is best coating for canvas since it does not crack when stretched. This advanced polymer coating will not yellow or go brittle. Print Shield - Best For Paper - PremierArt Print Shield is best coating for prints that require an increase in lightfastness and scuff resistance. It is also excellent for the elimination of gloss differential. This lacquer based coating designed for long life when used with the many pigmented ink systems on the market today, available in 400ml aerosol can and 5Ltr. bulk size for Spray Gun application. Eco Elegance – For Paper - PremierArt Eco Elegance is an embellishing gel used to give a personal touch to your ink jet prints. Made from the same material as Eco Print Shield, this non-yellowing gel will not go brittle. This water based gel comes in clear and white, allowing you to mix with acrylic paints for coloration, giving an Impasto look to your ink jet prints. 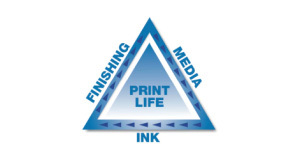 IMAGE PERMANENCE TRIANGLE - Finishing inkjet prints is the least understood process in the inkjet printing process. As inkjet printing is rapidly replacing silver halide printing, there are some major differences in the finishing requirements for inkjet that were not important in silver halide. The following information will help you understand the requirements in finishing inkjet prints. We want our images to last for generations, and we have presented the information to help you achieve that goal. Premier Imaging Products was established to meet the needs of serious photographers and digital artists that require image permanence in their inkjet prints. Early Ink jet prints were extremely unstable, with some examples of fine art images fading within 6 months in normal display conditions! The industry has made tremendous progress since the original photo printers, but there are still parameters that affect print life that still needs the attention of the print maker. Think of the printing process as a triangle. Each side has an equal influence in determining the longevity of the inkjet print. What is a giclee reproduction? *Giclee(g-clay) is an elegant, state-of-the-art reproduction. The name comes from a Frenchprintmaker's term for "fine spray", and was adopted to distinguish the technique from ordinary offset printing. A giclee is created by a digital printer's tiny ink jets that spray millions of droplets of water-based ink onto fine archival art paper or canvas (or linen) known as the "substrate". The combination of specific inks and substrate are carefully selected to assure maximum print longevity. 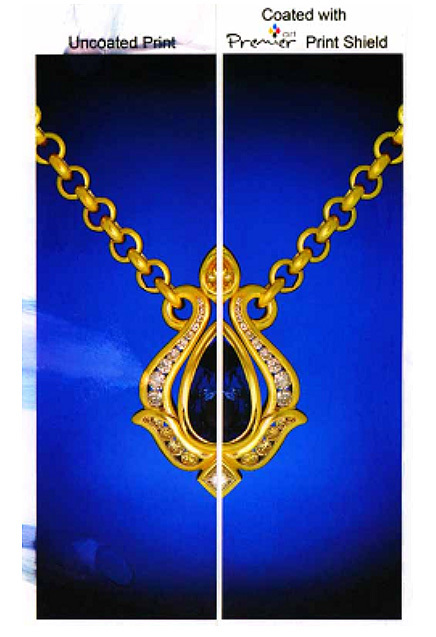 Premier Imaging Products have used this photo to show how a print can benefit from spray coatings; the image was halved and then mirrored. The right hand half was sprayed with 3 light coats of Premier Art Print Shield, then cured for 24 hours prior to water testing, the left hand image shows the effects of following water resistance tests. Premier Imaging Products announces the introduction of their premium line of fine art products: Premier’s new breakthrough, state of the art inkjet coating technology yields the highest D-Max in the industry. The increased D-Max also yields the highest color gamut available in inkjet fine art products. The Generations family of canvas have been especially designed for image permanence, and are extremely resistant to pre-mature yellowing. - Premier Art Print Shield Logo. - Premier Art Eco Elegance Logo. - Eco Embellishing Gel Data Sheet. 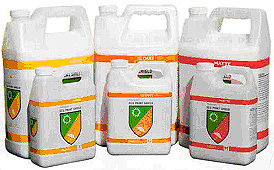 - Premier Eco Coating Range Data Sheet. - Premier Art Canvas & Coatings Poster.